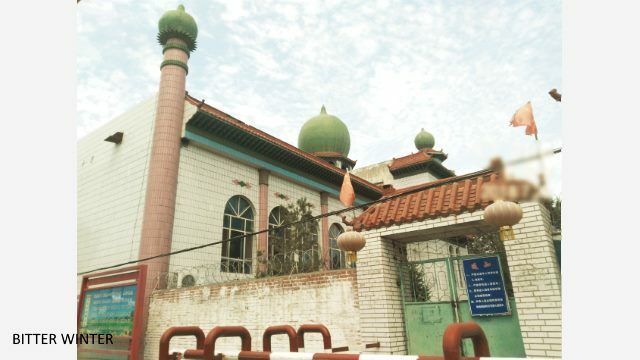 The mosque in Liugong village’s No.2 Production Team has been forcibly shut down. The gate has now been fitted with barbed wire. The crescent moon and star symbols on the tops of the pillars at the mosque entrance have been demolished. 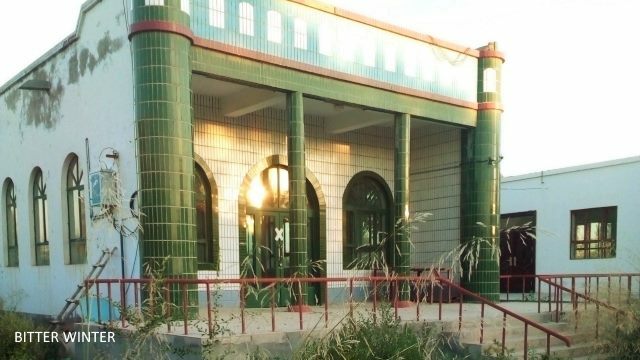 Most mosques in this Xinjiang city had been demolished already, but now the remaining ones are being shut down as well. The residents of China’s western region of Xinjiang where almost half of the population are Muslim Uyghurs, have been going through increasingly intense persecution. Disguised as the fight against terrorism and religious extremism, the crackdown on Muslims has especially intensified ever since the revised Regulations on Religious Affairs came into effect in February this year. 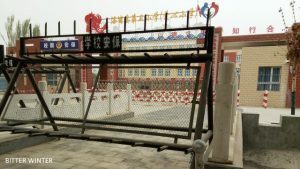 From being put in “transformation through education” camps to being unable to celebrate their religious festivals, Xinjiang residents have had to endure through it all. In the city of Shihezi, the authorities have demolished most of the mosques. Bitter Winter has recently learned that now even the remaining ones are being shut down. 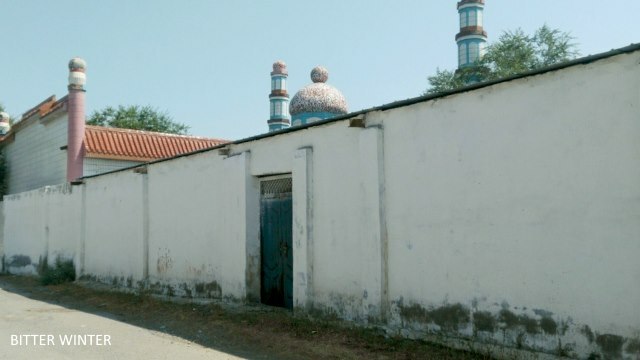 Two mosques in the Liugong village were recently shut down forcibly. 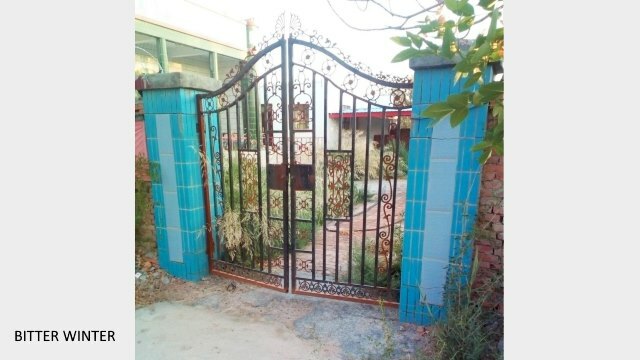 Their crescent moon and star symbols have been removed, and the entrance is blocked. The authorities have installed surveillance cameras as well as guards at the mosques to ensure believers cannot enter. 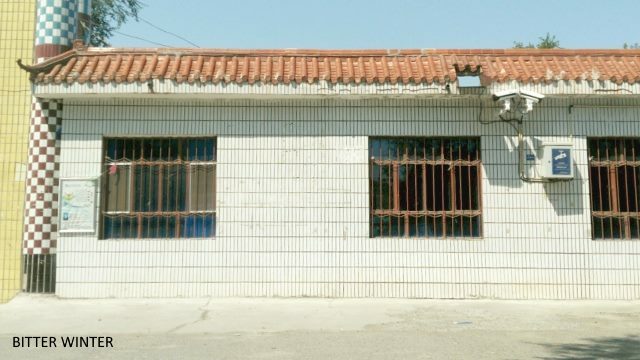 Another mosque in one of Shihezi’s agricultural divisions was shut down in April. Its imam, who was in his sixties, was taken into custody and his whereabouts remain unknown to date. 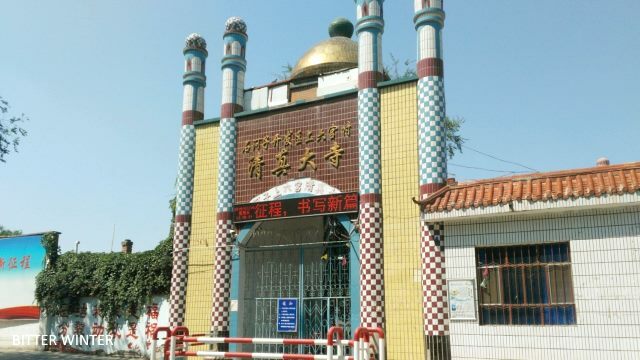 According to a local source, the authorities maintain a floor at the Shihezi Lyuzhou Hospital where they keep the imams. What used to be the ward for psychiatric patients is now the place where these imams are tortured. 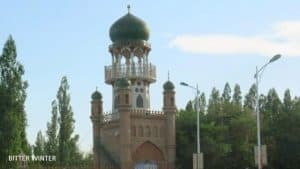 The source also revealed that some imams arrested from southern Xinjiang are held in Urumqi’s Dabancheng district, the northern part of the region. 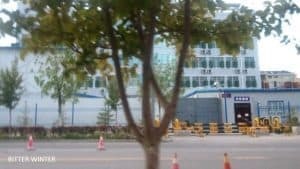 At the “transformation through education” camp there, they are forced to pay their living expenses at 400 RMB or 60 USD per day and eat Han cuisine. They are also forced to recite the “Spirit of the 19th National Congress” of the Chinese Communist Party at the camp. Looking from the side door of the mosque, one can see that the crescent moon and star symbol atop the mosque has also been demolished. Two cameras have been installed on the right side of the mosque’s main entrance. 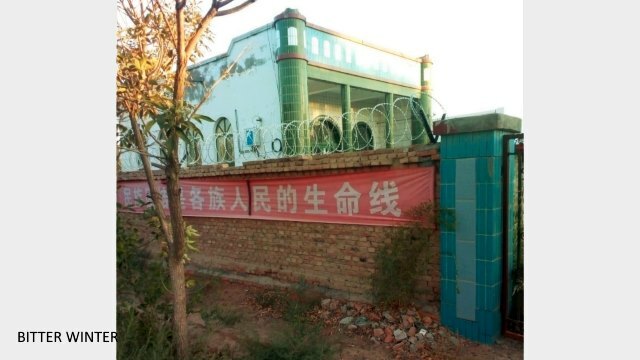 The mosque in Liugong village’s No.7 Production Team has been shut down, and the perimeter wall has been covered with barbed wire. Two Chinese flags have been erected, one on each side of the entrance. 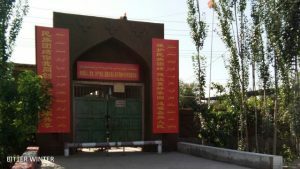 The gate of a mosque in No.1 Agricultural Company, 148th Regiment, Seventh Agricultural Division has been locked with chains. More than four months have passed since the mosque was shut down, and the courtyard has become overgrown with weeds. The gate in the courtyard has been sealed off by the police. The crescent moon and star symbols at the top of the mosque and the pillars have been demolished. The wall outside the mosque has been fitted with barbed wire to prevent believers from climbing over it to perform namāz (worship).